Dragon Ball Z's most famous face ups his power level with glowing hair! Features one of Japan's most famous exports, now with glow-in-the-dark hair! An Entertainment Earth Exclusive! From the Dragon Ball Z anime and manga series comes the main character in awesome Pop! Vinyl style! 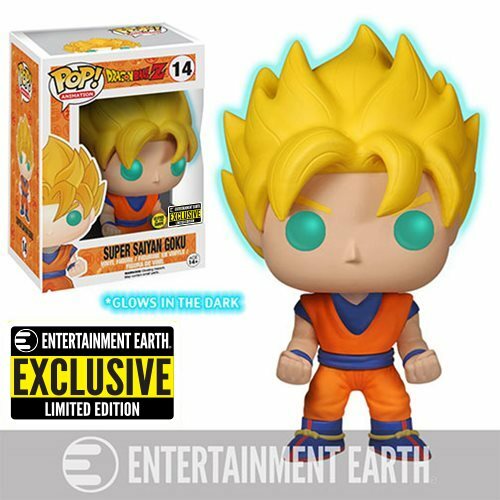 Our Entertainment Earth Exclusive Dragon Ball Z Glow-in-the-Dark Super Saiyan Goku Pop! Vinyl Figure stands 3 3/4-inches tall and makes a great gift for otaku and adult collectors alike. When you see just how bright the Super Saiyan Goku Pop! Vinyl Figure looks you'll want to collect the rest in this line of Dragon Ball Z Pop! Vinyl figures from Funko! Ages 14 and up.